What’s it like to cruise for 42 days in Asia and the North Pacific on a small ship luxury cruise? Alan and I will be the guinea pigs testing the waters for you during our next boomer travel adventure on a Hong Kong to Vancouver cruise itinerary with Seabourn Sojourn. Actually, we’ve cruised a similar route in reverse years ago on a cruise from Vancouver to Singapore. The travel highlights included exploring a smoking volcano on the Kamtchatka Peninusla and discovering just how steep the Great Wall of China can be. We’re all smiles when it comes to boarding a cruise ship. Here we are in October as Seabourn Sojourn departed on a South Pacific cruise. Our latest boomer travel adventure will take us to the ports of Kaohsiung and Keelung for a first-time visit to Taiwan. In China, we’ll explore ports that are new-to-us, when Seabourn Sojourn calls on Zhujiajian and Yantai. And of course there will be visits to old favorites like Shanghai (3 days and 2 nights), Tianjin, the port for Beijing (2 days, 1 night) and also Dalian. Want to follow along? We’ll be posting short updates in News for the Week so subscribe to our Weekly Broadcast. Alan and I are especially looking forward to taking it slow and easy in Shanghai, with plenty of time to wander and explore on our third visit to this vibrant city. The ship offers an overnight land excursion to Hangzhou, but we’ve already been there. In fact, the water ballet show, Impressions West Lake, is one of the most amazing performances that I’ve ever seen. The same goes for the port of Tianjin. Since we visited Beijing for two nights on that long ago northern Pacific crossing, we’ll explore the local area around Tianjin this time. Or maybe we’ll take advantage of an almost empty ship to make it our own private yacht. The Japanese ports on this cruise are mostly new to us, with the exception of Hakodate. Have you visited any of these ports in Japan? Looks like we’ll be returning with plenty of new shore excursion ideas for you. We’ll be crossing the equator again. Have you seen a Crossing the Equator ceremony? After a week of relaxing sea days—you know how we love them—Seabourn Sojourn arrives on the Alaska coast to explore Kodiak Island. 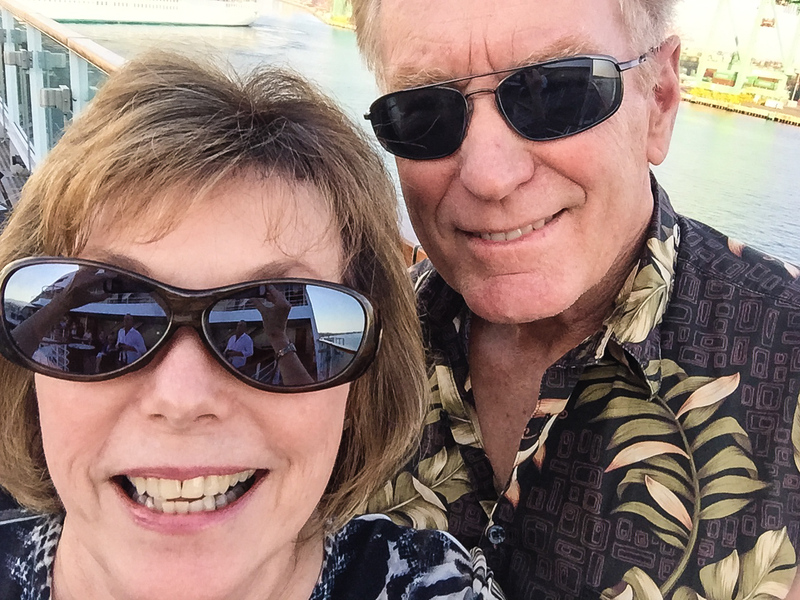 Alan and I had a memorable time hiking with history on another cruise. Then the journey continues to Hubbard Glacier, Icy Straight Point (new to us), and Juneau before cruising the Inside Passage. 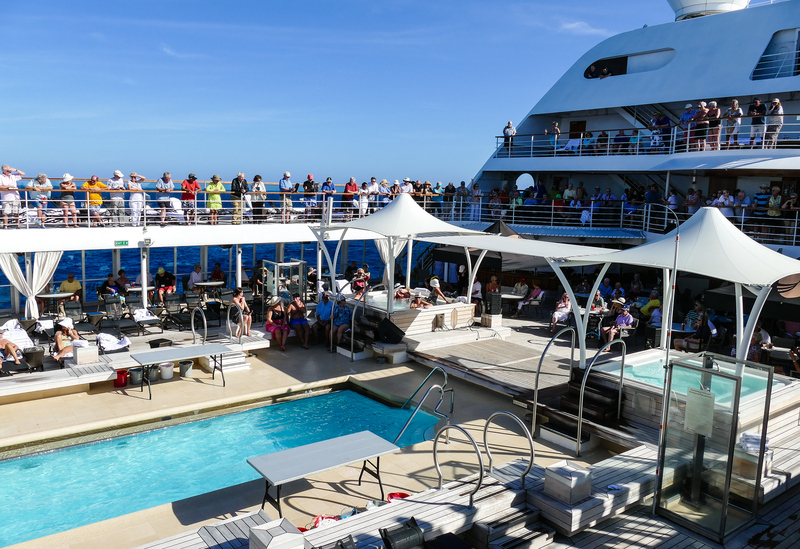 As often happens on cruises, the itinerary has been tweaked since we booked this trip. Originally, Sojourn was visiting Glacier Bay. It would have been our first time to finally experience this gorgeous Alaska National Park. But, for whatever reason, Hubbard Glacier and Icy Straight Point have been substituted for Glacier Bay. Oh well. We’ll make the best of it. Victoria, B.C. is our last port. Hope the flowers will be blooming at Butchart Gardens! And then we end up in Vancouver to catch a flight back home. For once, Alan and I have not booked many excursions ahead of time except for the first two ports in Taiwan and to visit the Miyajima and Itsukushima Shrine in Hiroshima. Once on the ship, we’ll probably book more as the cruise progresses. Is this taking a chance? Yes. But it also allows us to gauge the weather and our energy level before committing to a shore excursion. Part of our reasoning is that Seabourn has changed the way properly cancelled excursions are credited back to us. Rather than receiving cruise credit for spa treatments or fine bottles of wine, we prefer to get our money back. Seabourn has made it much harder, but not impossible, to do that. Preferring to avoid the hassle, we’ve chosen to take a chance on shore excursion availability as we cruise along. Do you remember the advice in the luxury cruise planner about building in an extra day or two so that you don’t miss your ship? We’re doing exactly that. Our plans include a round-trip Alaska Air flight from Missoula to Vancouver, on the front and back end of the cruise. The international portion of the flight to Hong Kong leaves from Vancouver on Air Canada, which we booked through Seabourn because it was the best price that we could find (that’s not always the case). This will be our first time in Air Canada business class. And I’m excited about experiencing the Fairmont Vancouver Airport Hotel. Staying in a luxury hotel before a luxury cruise completes the package for me. And, since the Fairmont is located inside the Vancouver airport, arriving and departing will be so convenient. In Hong Kong, we’re spending two nights in the Kowloon Shangri-La Hotel to recover from jet lag. As luxury travelers, we want to arrive at the ship rested, relaxed and ready to have fun. 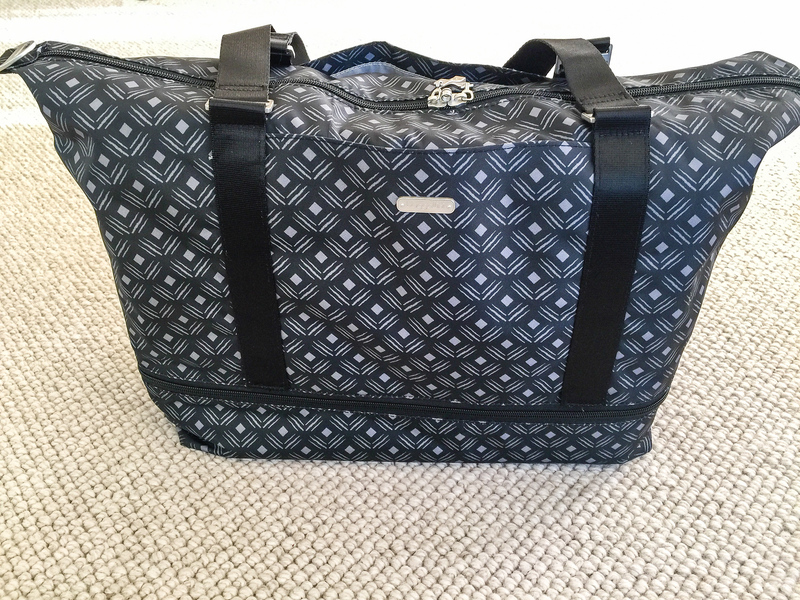 Yes, I’m taking the Baggalini expandable carry-on duffle bag as my personal item on the plane. I just love this bag! As members of the Seabourn Platinum Club, Alan and I receive 15% off shipping luggage with Luggage Forward. So we’re taking advantage of that perk to send checked luggage to the ship in Hong Kong. Although we never pack more than 50 lbs per bag, and only bring 2 checked bags, lugging around heavy luggage is hard on the boomer body. Will our luggage be in our suite upon arrival? I’ll let you know. But shipping has forced us to pack early, which is a huge benefit to a procrastinator like me. The last week before leaving on the cruise will be nice and relaxed rather than the stressful event it usually is. Alan’s happy about that. And, of course, I couldn’t go on a luxury cruise without shopping first at Chico’s. I found several cute tops to go with pants from pervious seasons. Follow me on Facebook or Instagram as I share the ways I mix and match Chico’s clothes on a trip. Want to keep up with this boomer luxury cruise adventure? I’ll be posting photos and very short posts on the My Itchy Travel Feet page at Facebook, too.